Another Saturday and another event for me. This time Stand and Bang in Woking in a ring with ropes as opposed to an octagon with fencing. Yes it was time for a bit of K1 / klickboxing and straight boxing. 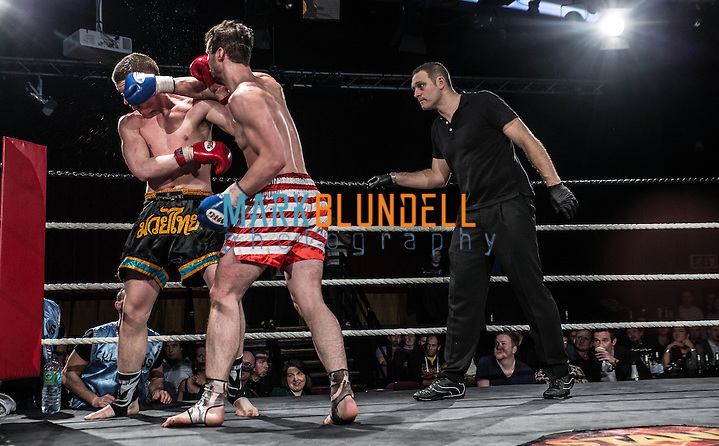 This isn’t my normal fare however the few kickboxing events that I’ve been to have been great fun, both photographically and from an action perspective. Stand and Bang is run by Kyle ‘Ringmaster’ who organizes, produces and MCs on the night. He’s a top guy all round. Prior to the kick off Kyle was quote stressed ensuring that everything was how it should be, making sure that his event was spot on for all in attendance. Once the lights went down and the tux was on like superman an air of calm descended and he was in his element presenting to the people in attendance. 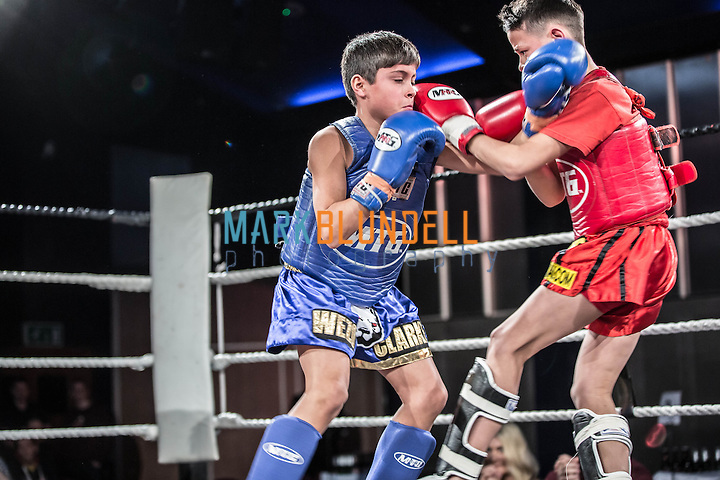 The first bout was between two amateur youths, ( JAY MILLER VS. WESLEY CLARKE ) who gave a Great account of themselves proving that age should be no barrier to the sport and youngsters can compete just as well as the adults. Anyone who thinks it’s wrong seeing kids go at it in a combat sport needs to get their head checked. These two did a great job of showing the sport at its best. 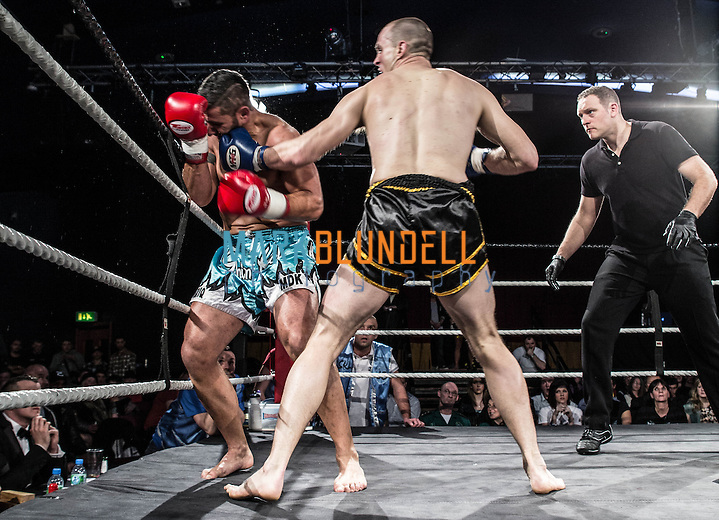 The second bout between LUCIANO MENDOLA and MACE RUEGG almost got fight of the night. To young combatants fighting each other with the no fear attitude that only youth can bring. For x rounds both fought hard and fair with the exception of one picking the other up, youthful exuberance taking hold for a split second. The final set of fights were for ISKA titles and delivered in spades. Great entertainment and skill shown by all. For me I enjoyed GEORGE DAVIES VS. TRISTAN TATE. I scored the first round as a draw, duriung the middle rounds it looked as if Tate was tiring, Davis having him on the ropes and boxed into the Shinkick Gyms corner for a while. 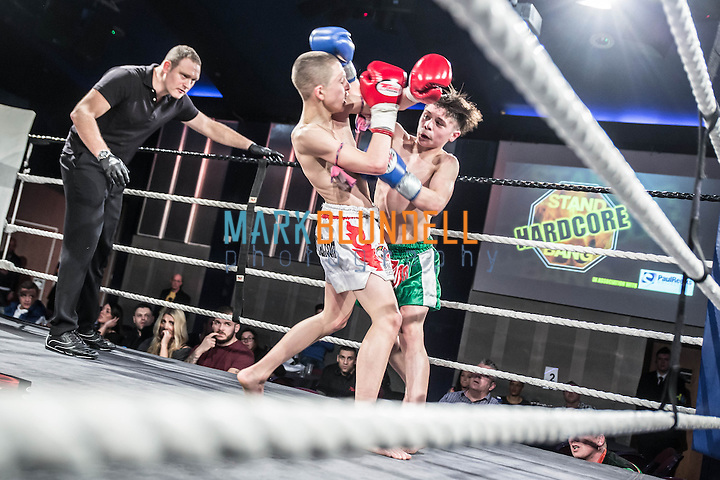 Tate, egged on and encouraged by his sibling Andrew Tate (himself 2x world kickboxing champion) survived the round after a few shaky moments. After the break and strong words from his corner Tate recovered and managed to get back into the fight. 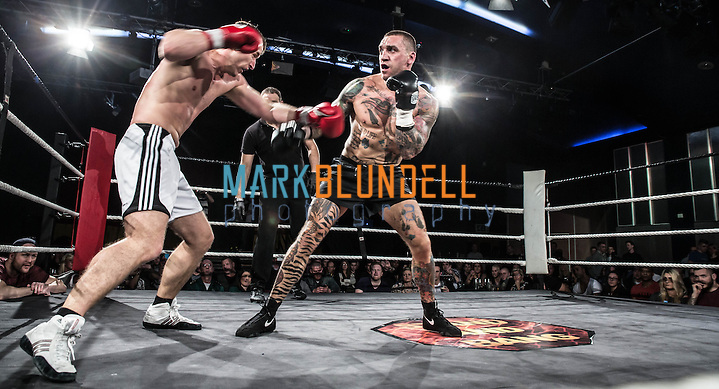 Tate finished strongly and got the win on the judges cards leaving him to take the belt home after a two year lay off from competitive pro rules combat. All in all,this was a superb evening of fighting from start to finish, all fighters showed courage during their time in the ring and respect whether winning or loosing after the end of the fights. 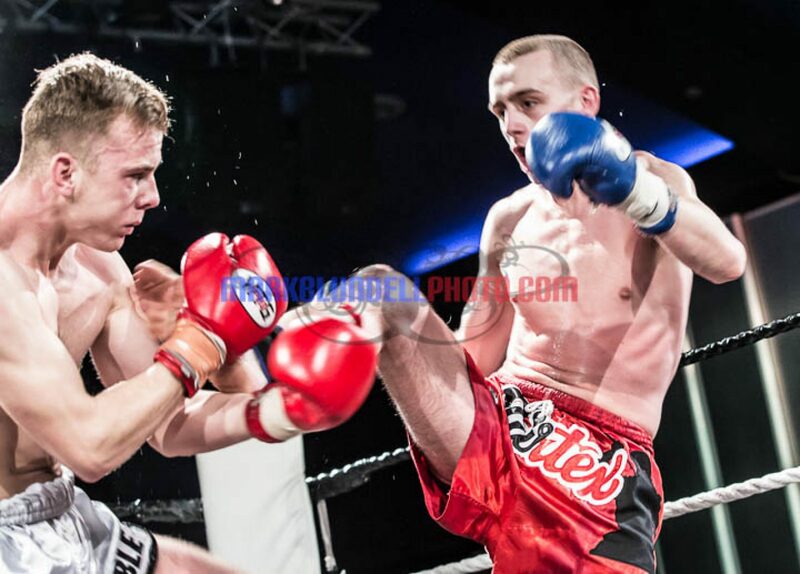 Kyle’s attention to detail was superb, making sure that fighters, staff and guests had a great evening. Unfortunately there was a small scuffle on the crowd, however this was soon resolved by he security at the HG Wells centre and some choice words from the ringmaster and proceedings soon got underway again. There really is nothing not to like about Stand and Bang and I would use anyone interested in a high octane night to check out the event in the future. I know that there is already another in the pipeline billed as a more amateur event which of its half as good as this one will be a great day out.